One community does it by taking one week each year to provide free training to promote safety at work, at home, and in the community. And, it’s a big community, last year over 1,300 people registered for more than 3,000 training seats and those people represented 260 organizations from 128 cities in 21 states. In 2019, over 130 free classes, sessions, and demonstrations, a Safety Expo and a Community Safety Forum will be held at nine area locations by hundreds of volunteers with the support of over 100 organizations who partner, sponsor, or provide resources to make the event happen. What is Safety Fest TN? It’s not any one thing, one person, one company, one city… It’s a manifestation of a community’s safety attitudes, beliefs, and values! 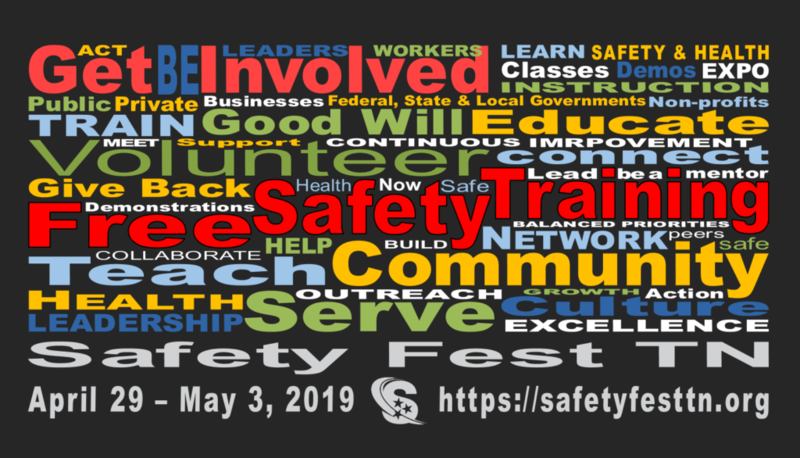 Safety Fest TN will be held April 29 – May 3, 2019 at multiple locations in Oak Ridge and Knoxville, Tennessee. It is the combined efforts small and large businesses; local, state, and federal agencies; colleges, universities, and vocational schools; trade and labor unions; and non-profit organizations.